Over the past few years, hypermarkets in China struggled to grow as overall retail sales growth weakened. Kantar Worldpanel, the global leader in consumer panel insights, reported a mere 5.1% value growth in 2014, 3.5% lower than the previous year. Meanwhile, top 10 retailer groups grew only at 3.2% whilst the top 5 at grew 1.7%. As growth is becoming more difficult, what can modern trade retailers do to cope with China’s ‘new normal’? Kantar Worldpanel’s business growth model revealed three key levers to obtain growth for retailers: number of shoppers, frequency and basket size. Below are four strategies retailers can take to return to growth. As competition becomes more intense and rental, utility and labour cost rises continuously, large retailers have started to adjust their strategies and focus on lower tier cities. According to the statistics published by linkshop.com, 201 stores (department stores/supermarket) were closed in 2014, while in 2013, only 35 stores closed. Amongst all store closures, 178 were supermarkets / hypermarkets. At the same, the market also witnessed Walmart opening 25 new stores and most of them were in lower tier cities. Winning shoppers in lower tier cities is becoming the new growth engine for major brick-and-mortar retailers. The report released by Kantar Worldpanel up to Q1 2015 indicates that the top 10 retailers’ total share in the lower tier cities are substantially lower than in high tier cities and continue to slide. This means that regional/city champions in those city tiers hold definite advantages. Of course, it is challenging to conquer the market place in the lower tier cities. There are 1609 cities in tier 4-5 city tiers, where 40% of the urban population resides. It is critical to strike a balance for national players between centralized management and meeting the different needs of local shoppers. Consequently, managing rapid store expansions while bringing high standard merchandise and service experience are fundamental to their successes. As private vehicles and high-speed internet become more widely available, more and more consumers tend to favour large shopping trips and online shopping while reducing their visits in hypermarkets. This presents bad news for hypermarket operators and also categories relying on impulse purchases. It is critical for retailers to maintain footfall. Our study across consumer purchases of fresh foods and groceries indicates that vegetables and fruit are the most frequently purchased categories, with annual trips reaching 40 and 35 times in a year respectively through modern trade outlets. Despite changes in lifestyles, consumers will continue to value freshness and health. Modern trade stores provide more high quality and trustworthy fresh foods and also longer opening hours satisfy the shopping needs after work. Despite the slowdown in FMCG sales, fresh foods in hypermarket and supermarket maintained double digital growth, becoming the new opportunities embraced by all retailers. Analyses from Kantar Worldpanel also suggests those retailers with stronger performance in fresh foods tend to perform strongly in the grocery sector. This highlights the importance of fresh foods to drive store traffic. However, the fresh foods sector is also difficult to manage, especially in terms of stock and competitive pricing. Retailers need to improve their connection with supply chains and focus more on high value and ‘organic’ produce to grow profit in this sector while increasing consumers purchase on other categories through effective category management and cross-promotion. Fundamentally, fresh foods shall become a critical lever to realize the growth of total store business. At present, rapid store expansion requires high investment and lower return in the first few years while focusing on fresh foods will only maintain store traffic. Hence improving the spending per shopping trip can present a quick win on the basis of existing store portfolio. The past growth driver analyses indicate that for hypermarkets to improve trip spending, retailers need to embrace premiumization opportunities and drive bigger pack size. 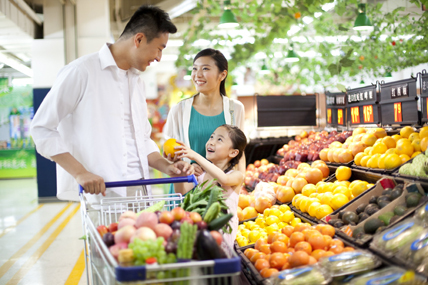 Premiumization is a key trend in the China FMCG market in recent years. From skincare, personal care, baby care and even food and beverage, many categories rely on their growth as shoppers trade up and move to more premium product choices. However, with the slowdown of disposable income, consumers are also spending more in housing, eating out, consumer electronics as well as education. Therefore household expenditure on basic foods tends to stagnate. After a few years of high price inflation, more categories will experience difficulties to further their premiumization journey. Among all the FMCG categories Kantar Worldpanel tracked, only 46% of the categories’ average price growth was higher than 3% whilst the number was still 52% in 2013. On the other hand, both the hypermarket channel and top 5 retailers manage to grow their sales of bigger pack sizes, though this also means a reduced number of products in the baskets. Similar to premiumisation, it is impractical to upsize without limiting growth of total consumption. Therefore, stimulating impulse purchases through effective merchandising and joint promotions, so that consumers will buy more items rather than merely bigger packs will become a future focus. All major retailers in recent years have started to diversify their business portfolio beyond hypermarkets. Boutique supermarkets focusing on high income shoppers, like Ole under CRVanguard, have become a popular area of investment. Apart from Ole, BHG under Beijing Hualian and Bravo under Yonghui are also key players in this sector which aims to secure the loyalty of shoppers with aspiration for high quality imported products. CVS (convenience stores) are another fastest growing format in China. Up to Q1 2015, Kantar Worlpdanel revealed an average of 10% growth attained by the CVS sector as a whole, the only format that reported double digit growth within modern trade. In the previous 12 months, the growth rate of CVS was only at 6.6%. In Nov 2014, Carrefour also opened its Carrefour Easy banner to move into this high growth area to complement its traditional hypermarket offer in China. CRVanguard also launched its Tesco Express banner, as a means to test the community store concept in Shenzhen, which prominently features fresh foods, packaged foods and other daily meals to satisfy the needs of the neighbourhood. While maintaining investment and diversifying their offline formats, all modern trade retailers are venturing into the e-commerce territory. The newly launched Feiniu.com under RT-Mart demonstrated its plan to move to national distribution to serve its 3 million registered users. According to its own statistics, feiniu.com already achieved between 13,000 to 15,000 daily orders with average spending of RMB 160-180 each. Walmart also launched its smart phone application ‘Express Buy’ to take advantage of the O2O boom as well as taking control of Yihaodian, the leading e-commerce platform for FMCG. In summary, it is impossible to find one solution to address the growth challenges in China for modern trade retailers who are increasingly focusing on fresh foods, premiumization, impulse purchases, multi-format strategies and e-commerce investment. The rapidly changing retail landscape in China will only favour those who adapt and innovate. Despite the difficulties encountered by modern trade retailers, the sector remains the most important purchase channel in China. Only when retailers equip themselves with deeper shopper insights and new ways of satisfying their needs, can they achieve a competitive advantage and ambitious growth in the 2nd largest consumer market in the world.